The former Wimbledon striker made the shock admission a week after it emerged two top footballers – including an England star – plan to come out. In his first in-depth interview about brother Justin since his tragic suicide in 1998, he said: “I begged him, I threatened him, I did everything I could possibly do to try and stop him coming out. “I gave him the money because I didn’t want the embarrassment for me or my family. Had he come out now, it would be a different ball game. John, 53, said: “I’ll never forget when Justin first told me. He called me in the evening time and said to me: ‘I’m gay’. "Then he said to me: ‘I’m planning to go to a newspaper’. I said to him: ‘Oh heavens forbid... oh my God. We don’t need that. You’re mad’. “For me and my family it was like Hiroshima or Nagasaki on our lives. It knocked us dead, it was a total shock. “People might not like it, but I was trying to protect my family. “You’ve got to remember the public’s perception of homosexuality at that time was that it was an abomination . It was taboo. Street boys were beating up gays in nightclubs. “I give him credit for having the courage to come out and say it. But it caused a lot of confusion and animosity towards him, me, and my family. 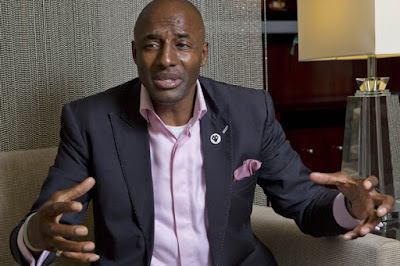 “During matches, 30, 40, sometimes 45,000 supporters sang at me: ‘You’re big... you’re black... your a*** is up for grabs... Fashanu... Fashanu’. “As a result of him saying what he said, my mother died because of the stress. She actually died a year later on the day of his birthday. "She was already old, very fragile and suffering cancer. The Gladiators presenter said of the two football stars preparing to come out as gay , which the Daily Mirror revealed last week: “If these young men feel it is the right time to come out and announce they are homosexual, please don’t anybody victimise them. Not sure what to say about this story, apart from stating the obvious; it's completely grim. John has made the hush-money claim before, in the Independent in 2011. 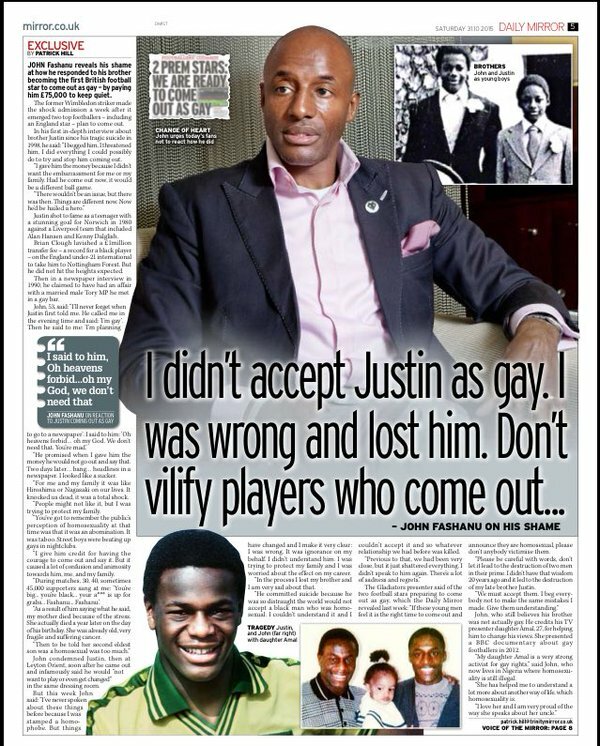 See also My brother Justin WASN'T gay he just wanted attention, says John Fashanu, the Mirror, March 2012. But his assertion that Justin invented stories for money is true. His tabloid tryst was a Faustian pact. 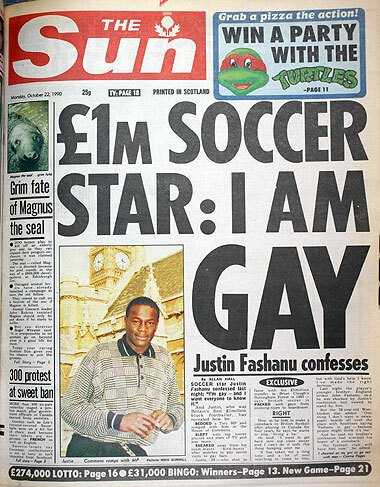 In 1998, a then debt-ridden Justin was paid handsomely by The Sun for his coming out story - involving an unnamed Tory MP - though years later he admitted it was made-up to up the fee. 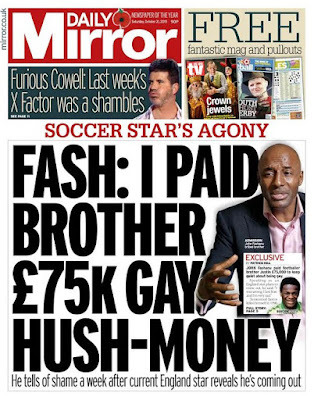 He'd previously tried to sue The Sunday People, the Mirror's sister paper, after they ran a front page story; 'I am not gay'. He later sold a story claiming an affair with Julie Goodyear, who played Bette Lynch in Coronation Street, and a lesbian. One wonders if John was paid for this? 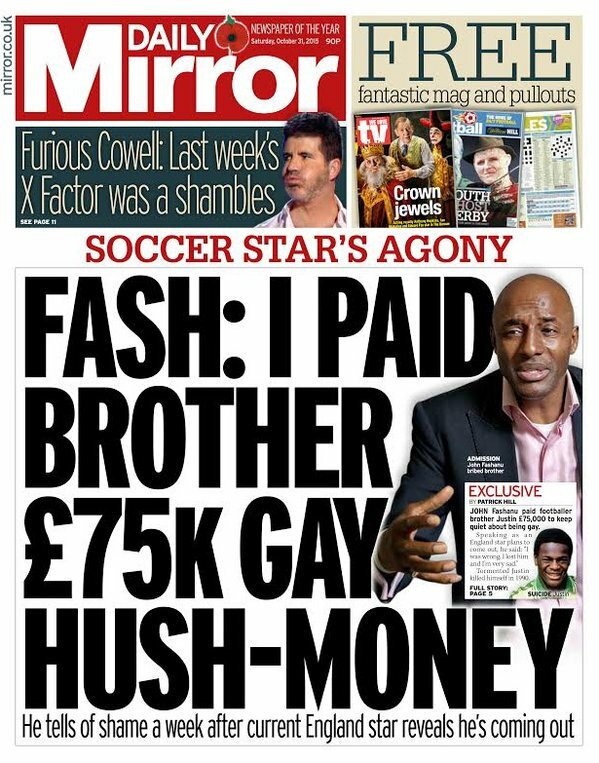 Oh, and though the Mirror hook this story on their front page last week about two premier league footballers coming out, they leave that there. PS There's an excellent essay by Juliet Jacques, Justin Fashanu And The Politics Of Memory, on the myths that have evolved about his life and death. Julie Felix is a renowned American folk singer. Julie Goodyear played Bet Lynch. Fork knows how that happened!